The Christmas season is especially known for being a time full of family drama that some us can barely get through. But if you are one the lucky ones who doesn't have to suffer because of the complicated family relationships or you need to be distracted with a different kind of drama, Daily Magic Productions have something for you! It is a new addition to the Yuletide Legends series. Santa was last seen near an island when he was suddenly swept away by a storm. Yuletide Legends: Frozen Hearts Collector's Edition is a beautiful Christmas-themed game. You are not going to believe what your role in this game is going to be... only you can save Santa and Christmas before it is too late. I know, I know... we save Santa's every year and have saved a couple already thing year, but that is what you do during this season. 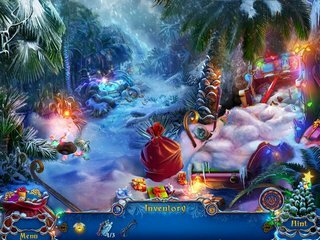 This game story incorporates your classic Christmas characters, something similar to the story of Narnia, and gods' realm to it. You are a demigod who can save Santa from some absolute Christmas-hating place and restore the order. Santa was last seen near an island when he was suddenly swept away by a storm. When you arrive at the place, you find yourself in a very cold forever-winter kind of place where it is forbidden to celebrate Christmas. It all goes back to a lady who was born with a cold heart (does that remind of Grinch?). Anyways, you are going to see a lot of allusions to all the classic Christmas stories (none of which have anything to do with the actual meaning of Christmas by the way). The interesting Christmas-themed story is not the only thing this game has to offer. The gameplay content is pretty good, too. 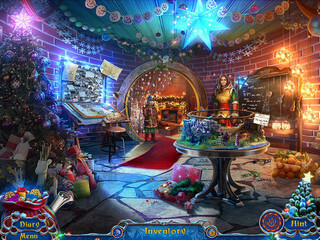 Both the hidden object scenes and the mini-games are creative, challenging and interesting. They are nicely designed and are mostly Christmas-themed. There are morphing objects in every scene and 16 achievements that you can earn throughout the game. You get 10 matching Pairs games, and collectible coins that you use to get the ingredients for cookies (Santa needs more energy!). There is also a strategy guide and a bonus chapter where you go to yet another adventure! 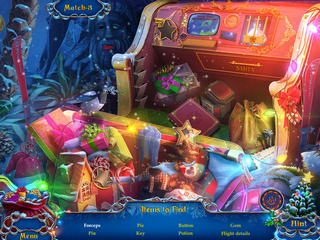 Yuletide Legends: Frozen Hearts Collector's Edition is a fun and entertaining hidden object puzzle adventure game! Don't miss it this holiday season! 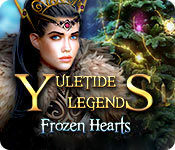 This is Yuletide Legends: Frozen Hearts review. Download this game here.